Every morning I hurriedly climb a back staircase to get to the office to begin another day of work. 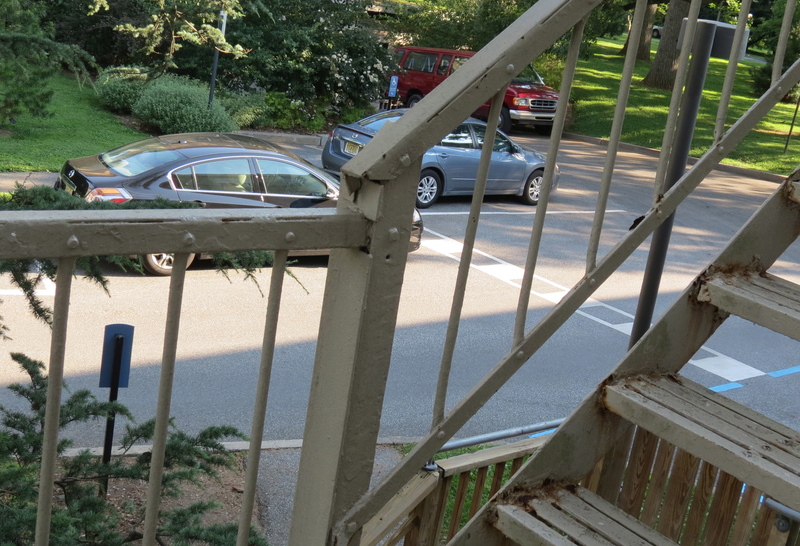 A week ago a small brown bird danced along the hand rail as I came up the steps. The little bird stood her ground. I admired her defiance. On the second morning, she was back flitting between a nearby tree and the railing. The night before I checked my bird book and identified her as a House Wren, with her turned up tail and warbling tweetie song. I thought she must have a nest somewhere. I looked in the tree and scanned the walls of the building to see if twigs might be sticking out from a light fixture or downspout, but no such signs appeared. Checking the Internet, I learned that Wrens can build their nests in strange places. A cavity nest builder, their nests turn up in abandoned bee hives, old hats, tin cans or flower pots. I couldn’t see any such cavities in the area. 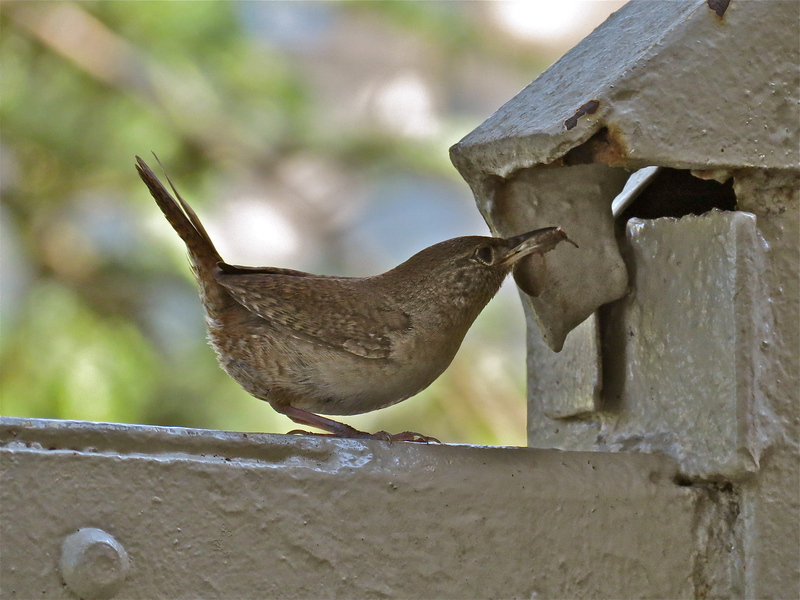 On the third morning, the Wren appeared again. This time I watched her from the window on the second floor. Surprisingly, the little Houdini just disappeared! I had to get a closer look to discover the magic trick. I inspected the railing and found a tiny opening between the pieces of metal. Evidently her brood had already hatched judging from the beak full of breakfast she prepared. Her magic disappearing act worked well as almost no one noticed her on the stairway–until those babies started squawking, drawing attention to themselves. I guess a loud voice trumps discretion for the young ones. As I rise and fall on the steps, I think about the deliberate actions of the parent Wren on the railing and the little ones tucked in the metal encasement. I wonder at their place on the staircase, intentions as deliberate as mine heading to the office. Beautiful ! It’s about the same volume as our bird box by the porch, isn’t it. ?